Back in January, I started designing a set of puzzle reference cards that I could take with me to events like Puzzled Pint or DASH. Strangely, I received an email at the same time from the folks at Kickstarter telling me about an initiative called Make100. They figured that since I’d spent so much time looking at Kickstarter campaigns on Going Last and backing them, that maybe I’d like to take a crack at creation. I freaked out, came up with a plan, and somehow made it work. The early version wasn’t fantastic, I admit. I’d decided to make this educational and try to teach people how to solve puzzles. After years of playing, running, and making puzzles, I knew this was a difficult task. It’s like learning proofs in Geometry—there’s a moment where it clicks, but all the moments before that can be filled with frustration. How do you know what code to break? How do you know what the author intended you to do? What’s the best order? 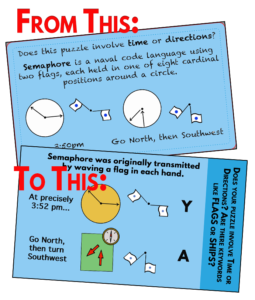 These ideas are difficult to get across to new puzzlers because they really need to be experienced before they can be understood. I know, cheap answer. My Geometry students weren’t happy either. Eventually, I came up with a new design, which had a little section set aside asking about the puzzle you were trying to solve. After looking at a puzzle, there are usually concepts and keywords that jump out at you and give a little bit of direction… but only if you know what to look for. This little sideways border says “HEY, if you see these keywords, consider reading this card!” Then, the front of the card provides further context. On the back is the solution method. As a teacher, I don’t often have the experience of making things like this. I know plenty of game designers and developers who build prototypes and musicians who make and produce their own albums and merchandise, but I haven’t been that kind of person. Let me tell you, it feels pretty fantastic. 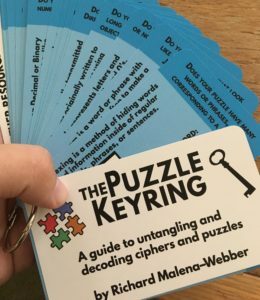 If you want to see a copy of the Puzzle Keyring, feel free to track me down at conventions later this year! I’ll be hauling this little project of mind across the country to show it off to everyone I know. Plus, with project creation under my belt, I’ll probably also have a game prototype or two to try out as well! Let’s make more stuff! I’m not sure if I can stop!